South Africa’s torrid record in World Cups is no longer speculative and there can be no more conjecture around their inability to progress all the way. Chokers is a tough term to swallow for the Proteas and it is more often than not used by opposition players and fans to get under the skin of the South African public. However, with every poor joke or loose insult bandied about, there is also an air of sincerity. The South Africans have capitulated in the most unfathomable of ways with the finishing line in sight. There won’t be a South African on the planet that is ready to watch the run-out against Australia during the semi-final of the 1999 World Cup at Edgbaston that led to pandemonium and a heartbreaking exit for the Proteas after a tie meant the Baggy Green went through to the final. The hurt runs deep and the scars still raw almost 20 years down the line. Hope springs eternal and the positive news for the Proteas is that with 20 years passing since that inexplicable moment of madness there has been time for a new generation of young cricketers to come through into the Proteas set-up. These youngsters won’t have had the deep-seated issues and insecurity problems that South African players before them have had to deal with. They are free of the self-doubt that had manifested itself in the minds of former Proteas players. When Lance Klusener came screaming down the wicket to an oblivious Allan Donald at Edgbaston in that fateful semi-final, Andile Phehlukwayo was three years old, Aiden Markram was five, Quinton de Kock was six, Lungi Ngidi was three and Kagiso Rabada was four years old. These are some of the finest talents the game has to offer at the moment and they are the generation the South African public had to wait for in order to begin winning ICC tournaments. Andile Phehlukwayo’s power hitting at the end of the fourth ODI against India in a charged environment where the pressure was intense was an eye opener to how fearless the young Proteas are. 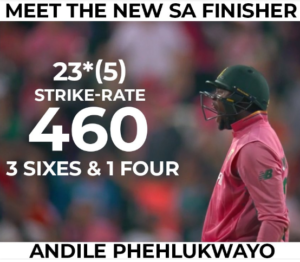 Phehlukwayo smashed 23 off five balls at a strike rate of 460.00, which was a record in itself for the highest strike rate for a five-ball innings. In years gone by, South Africa would have lost that game with capitulation following the first sign of pressure. By doing so Phehlukwayo ensured the Proteas won with 15 balls to spare and kept themselves alive in a series that they looked all but dead in. What does this mean for the Proteas hopes for the World Cup in 2019? England is the favourite here with the Proteas fourth in line with odds of 9/2 but with every successful performance under pressure, the young Proteas will grow into players with a history of being on the right side of knockout games. If fortune favours the brave then the young crop of Proteas will enjoy the rub of the green on more than one occasion in the future. The winds of change are blowing in the rainbow nation and with the talent coming through the ranks, winning a World Cup sometime over the next 10 years seems more and more likely.